Athens, Greece. Closing in on the end of another day of exploration, Greek salads, and sweating. Another shot in a part of the city that I enjoyed. Like a lot of my shots, I’m not sure I could find this exact spot again if I had to. But that’s no problem. The point was to remember the concept. All the prose in the world about this photo wouldn’t change this photo. 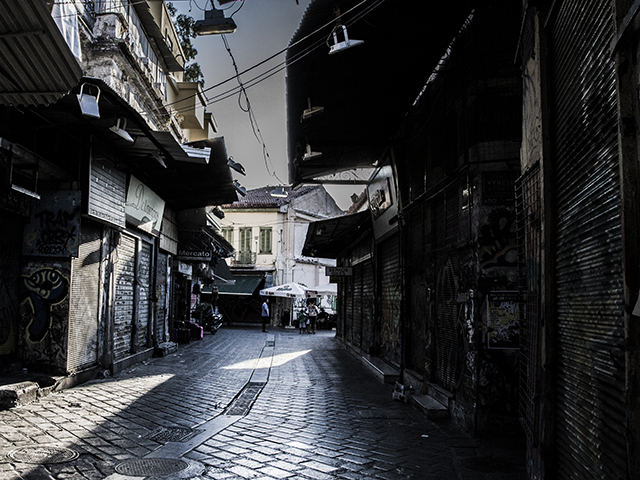 Essentially this is a shot of a scene that I knew would take my mind back in time to when I was exploring the streets of Athens. The brick road, the graffiti, the constance of wires overhead connecting every building to every other building and to poles in between them, the dirty, gated shop doors and the interesting balconies and living spaces above them…this was all stuff I couldn’t bear forgetting. There was one time that I looked up and saw people enjoying their balcony, having dinner out there…but for the most part, balconies were empty. Maybe it was a sign of the economic struggles, and people not feeling jovial, or maybe it was just because it was July in Athens and the heat and humidity were at their peaks. This city begs for more exploration, more consideration. Even if you took away the ancient attractions in Athens, the city incited my curiosity and piqued my interest. I kept thinking, ‘This is a place to inspire novels’. There is no Roman ‘Fontana Di Trevi’ to throw coins into here, but there are multiple ancient deities, and I’m relatively sure that one or all of them cast a spell on me ensuring my return to Athens someday.